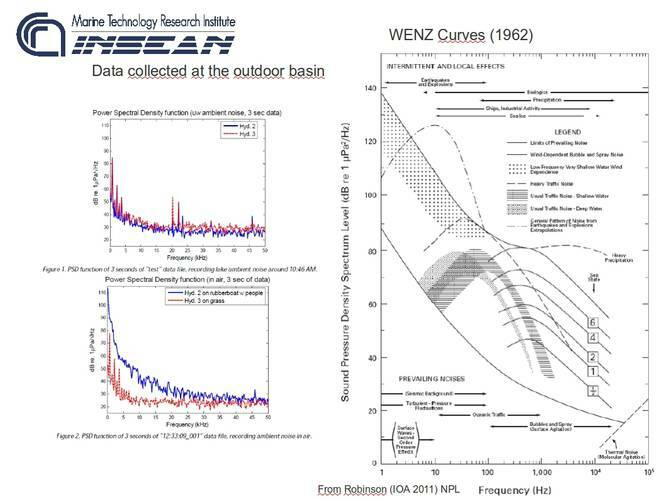 Since late 70's CNR-INSEAN is technically and scientifically focused on radiated hydrodynamic noise measurements on any typology of seagoing bodies (surface and/or underwater). During long years of activities a number of indoor facilities and both experimental and theoretical EFD (Experimental Fluid Dynamics) techniques have been used and developed in order to investigate, understand and prevent topics such as: both inner and radiated propeller noise evaluation and reduction, propeller-rudder-wake "noisy" interactions, sonar dome housing, cavitation noise evaluation and reduction, noise signature and mapping, etc. 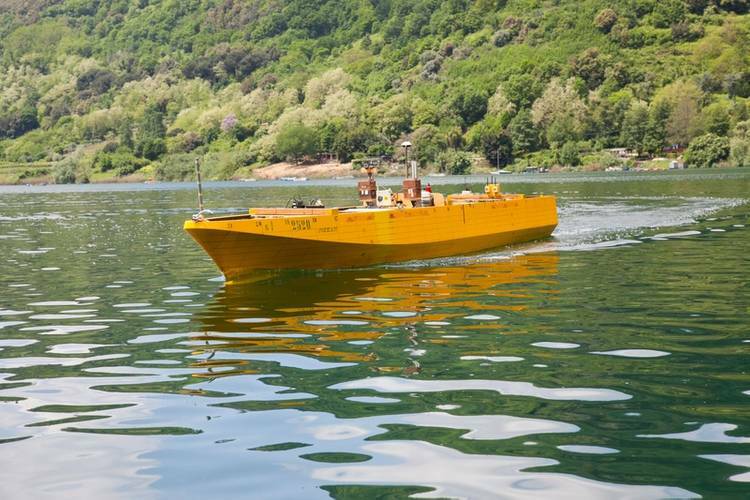 - qualified test bed for electronic noise quantification on underwater technologies (sensors, data transmission equipment, complete autonomous/tethered platforms, etc.). 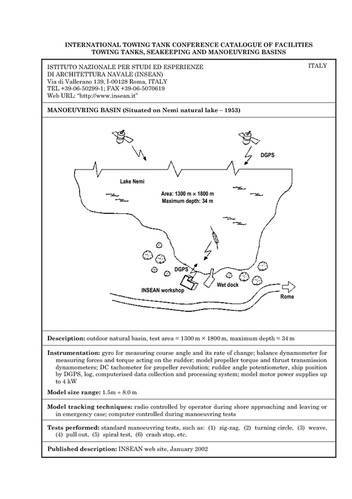 Since 1953 the CNR-INSEAN's Outdoor Maneuvering Basin officially is included into the ITTC's (International Towing Tank Conference) list (ref. fig. 1, ). 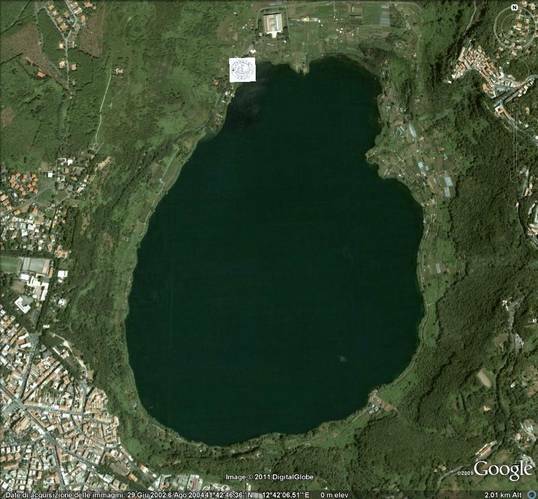 The experimental data gained so far are really very promising and the CNR-INSEAN's vision is to create a European very low noise underwater laboratory in fresh waters complementary with the federation of the current salt/fresh water test beds already running. For some specific applications, the preliminary test in calm and fresh waters could be of paramount importance before to carry out a "salt water" campain, much more risky, costly and logistically much more difficult to manage and organize. The availability of the test bed is really 7/24/365 and very easy to reach. 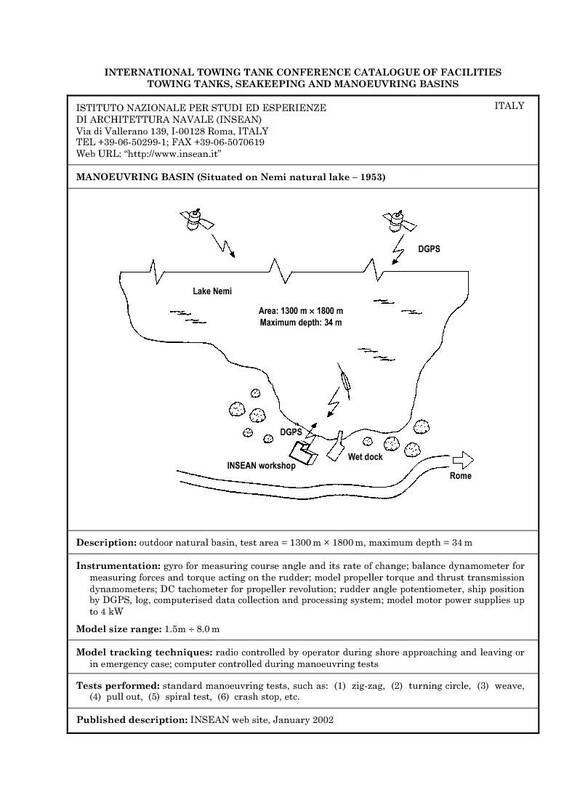 Actually in Europe not any unclassified fresh waters test bed is able to provide the very low level of physical background noise characteristics similar with the one of the CNR-INSEAN's Outdoor Maneuvering Basin. 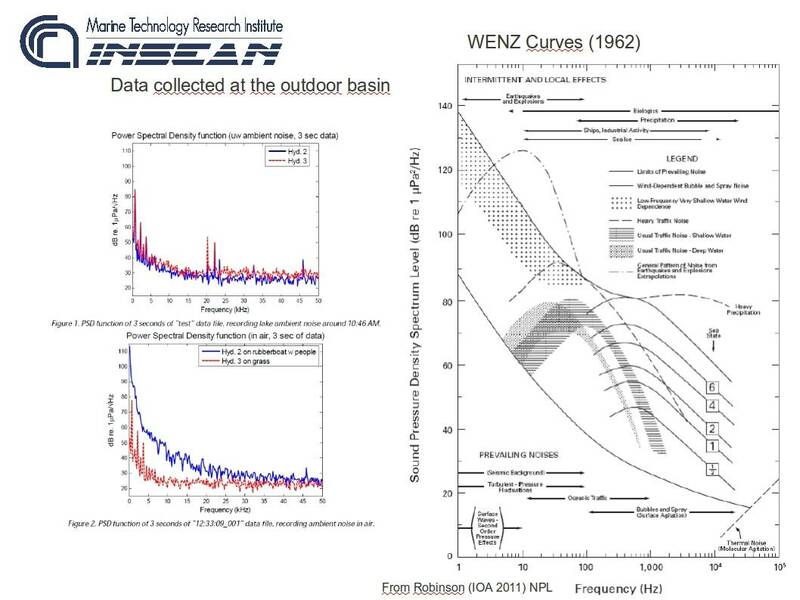 Just to provide some preliminary quantitative figures at a glance, in the following figure a comparison between the underwater (and air) background noise at the CNR-INSEAN's test bed and the worldwide well-known WENZ curves is provided. A difference of almost less than 20db compared with Wenz is really self-explaining. S. Mauro, Programma RITMARE - "Le tecnologie CNR per il mare - Free running self-propelled models for experimental tests", pag. 42. 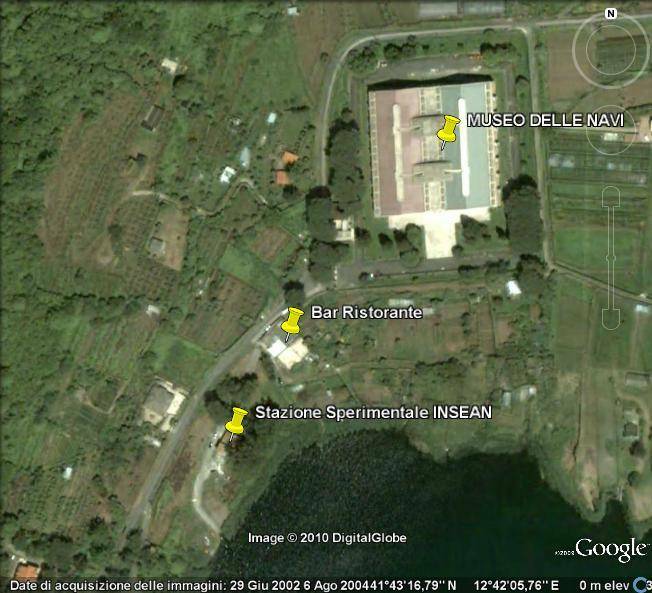 S. Mauro, Programma RITMARE - "Le tecnologie CNR per il mare - Outdoor basin for manoeuvrability tests and radiated noise measurements", pag. 51. Wenz, G., M.,“Acoustic ambient noise in the ocean: Spectra and Sources,” Journal of Acoustic Society of America, vol. 34, N° 12, pp.1936–1956, 1962.